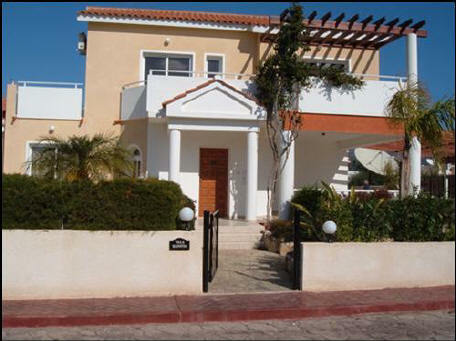 Elenitsa 3 bedroom villa in Coral Bay, Paphos, Cyprus. 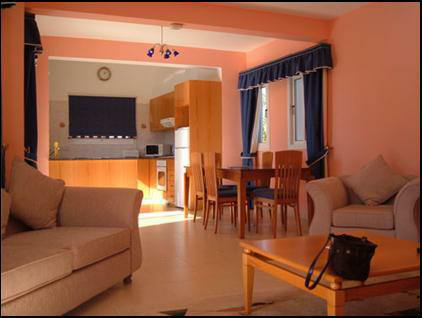 Elenitsa Villa, Coral Bay, Paphos, Cyprus. 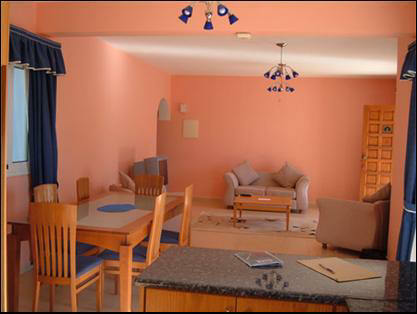 This 3 bedroom villa is in the ever popular Coral Bay area, sleeping up to 7 people, with 3 en-suite bathrooms with air conditioning throughout. In the heart of Coral Bay, with shady sunbathing/ BBQ terraces, swimming pool, sun loungers and parasols, set in a secluded colourful garden. This accommodation will suit those wanting a relaxed, restful retreat, as well as those wanting adventure, activities and attractions. 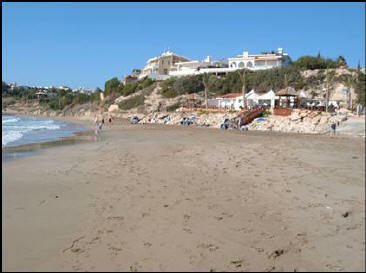 Coral Bay's sandy beach is a 5 minute walk, with is expanse of white sand, child friendly sea and beach facilities. 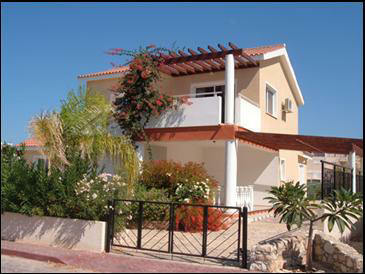 Coral Bay village has Taverna's, bars, shops and banking and is a 3 minute walk from the villa. SLEEPS:7 There is one double bedroom on the ground floor with a bath and W.C. and an additional, separate guest WC by the lounge. The first floor has two more double bedrooms with showers and WCS. Both bedrooms have doors that open to a spacious balcony. Bright airy accommodation, Italian floor tiles throughout, contemporary kitchen facilities and air conditioning everywhere. The ground floor has a lounge area with sofas, satellite TV, music system, DVD and video player. The large patio windows open out onto a shaded open air dining area, with views of the swimming pool and garden. The dining area has a family sized dining suite for 6. The kitchen is fully equipped with a fridge freezer, electric oven and hob, dishwasher, microwave, toaster and coffee maker. There is a washing machine, Iron and board. There is a shaded patio with gas BBQ for outside dining. Sun loungers, parasols and dining furniture are provided. The garden is walled and bordered by hedges which ensures privacy and seclusion. Off road parking is available on the private drive. 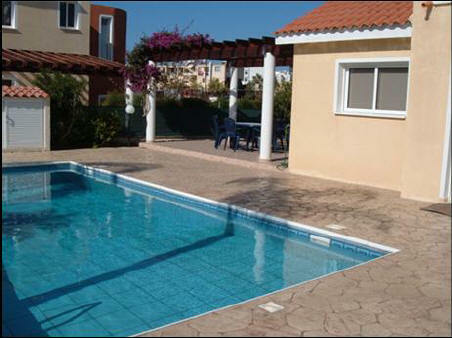 DISTANCES: 15 mins drive to Paphos, 5 mins to beach. EUR3.5 per unit per day.